We’re couple of weeks into the new year and many people are still following their resolutions to exercise more often in 2018. It is always great to hear about men and women who decide to make better lifestyle decisions like this for a multitude of reasons – including the health of your feet (even if you don’t think about it). Now, if you didn’t make any resolutions to start the year, it is never too late to take control of your healthy by choosing to be more active – no matter your situation. You might think “I’m too old” or “I weight too much” to exercise. Well, we hate to break it to you, but there are individuals who consistently show that weight and age don’t have to hold a person back! Case in point, 101-year-old Julia Hawkins set a women’s record in the 100-yard dash on the 4th of July last year. Yeah, but she’s probably been competing all her life, right? Wrong. Hawkins started athletic competition at the age of 75. Well, you might say “100 yards isn’t that far.” Sure, the race is called a “dash” for a reason, so let’s pull up another example – Harriette Thompson (now deceased). So what did she do? Only finish a marathon in 2015 at the age of 92. Oh yeah, she started running marathons at the age of 76 and was a cancer survivor. So what is your excuse for not exercising again? If you think you don’t have the time to work out, you just need to reframe your thoughts on the matter. For starters, some people have the misconception they need to basically live at the gym to see results, yet this is not the case. You only need to raise your heartrate for about half an hour three or four times a week. Even at that, you don’t have to raise your heartrate to superhuman levels. Taking a simple walk around the block is a great starting point. Actually, walking is a vastly underrated form of exercise. Plus, you probably have all the equipment you need (as long as you have a decent pair of walking shoes). For those who want a more challenging workout, we have some good news – you have an abundance of options here in Richardson. No matter what kind of activities you enjoy doing most---walking, running, cycling, swimming, weight training, etc.—there are places where you can go and start making a positive impact in your health. Heights Recreation Center. This establishment offers a variety of amenities to patrons, including a regulation-sized basketball court, large fitness and cardio areas, and new equipment. If you want to get in shape by playing ball or hitting the weight room, this is a great value option (especially for Richardson residents). Richardson Family YMCA. Much like with the Heights Recreation Center, “the Y” provides a wide range of options and amenities for members. This nation-wide organization is dedicated to helping foster healthy habits that empower people and communities. Of course, some people go there simply because they enjoy playing in the various sports leagues. Bachman Indoor Pool. Swimming is an outstanding option for your health and, even better, it enables you to get a full workout without subjecting your joints to forces from high impacts. Fortunately, we have some great options for pools around town – including the Backman Indoor Pool. As you swim laps or participate in water aerobics classes, you will burn calories, improve your cardiovascular system, and strengthen and tone your muscles. The City of Richardson trail system. Walking is an exercise too often taken for granted, but our local trail system will help you to appreciate it more. Even though a simple 30-minute walk might not seem like it does much, doing this little workout 3-4 times a week can potentially make a profound difference in your overall health and wellbeing. Cycling Center Dallas (CCD). This complete fitness studio is an outstanding option for cycling enthusiasts in our Richardson community. The various classes offered at CCD can help you get ready to hit the road or trails on your own bike by improving your lung capacity and strengthening muscles in your lower body. In addition to cycling programs, CCD offers other workout options as well, including TRX training. If it’s been some time since you were last physically active, consult with your primary care physician and our office first. We can help identify any potential risks and work with you to create a new exercise program that will keep you safe. It is difficult to overstate the importance of consulting with medical professionals before engaging in this kind of endeavor. Make sure you have proper equipment – including the footwear you choose. Your shoes need to be activity-appropriate, well-constructed, and provide support and cushioning in all the right places. If you are going to log miles running, make sure you choose running shoes that work with your pronation pattern! Ease into any new workout regimen. Far too many injuries happen when humans try to do “too much, too soon.” Remember, your body needs time to adapt to the physical forces you place upon it when working out. 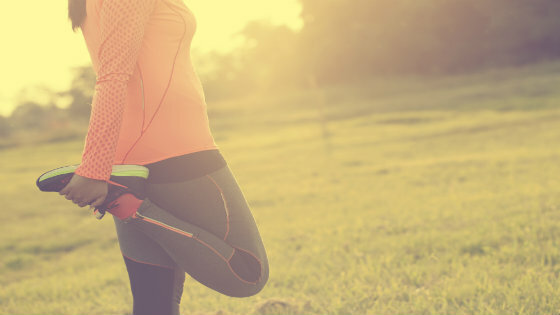 Always take the time to warm up and stretch first. It only takes about 5-10 minutes to prepare your body immediately before your core workout or recreational sporting activity, but doing so greatly reduces your risk of sustaining an injury. Your feet and ankles play a big role in your ability to perform physical activities, so make sure you take the proper precautions to lower your injury risk. That said, it’s basically impossible to eliminate all risk of foot and ankle injuries. Fortunately, we can provide the care you need. We hope you don’t get hurt while exercising or participating in your favorite sports, but we’re here to help if you do. 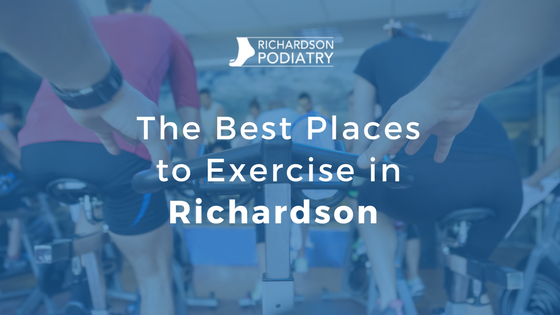 Contact Richardson Podiatry Center today for more information or to request an appointment by calling (972) 690-5374.